Students’ usage of tablets and smartphones in the classroom is high and has climbed from a year ago, according to a nationwide poll, which also sheds light on their frequency tapping into apps through mobile devices. The results of the survey, released this month by Pearson and conducted by the Harris Poll, offer insights to the array of ed-tech companies in the K-12 market that count on schools’ and students’ use of mobile tools to deliver content. According to the poll, 78 percent of elementary school students say that they regularly use a tablet, up from 66 percent a year ago. At the middle and high school levels, tablet use has also jumped. Sixty-nine percent of middle-schoolers report using tablets, an increase from 58 percent the year before. A smaller portion of high schoolers, 49 percent, said they are on tablets, though that number has also jumped 7 percentage points from the previous year. The poll also offers details on how often students in different grade spans are using learning apps—a favored delivery option for many ed-tech providers today. The survey shows that when it comes to learning on tablets, app use is highest at the elementary level, where 69 percent of students reported using those tools, compared to 60 percent in middle schools and 50 percent at the high school level. 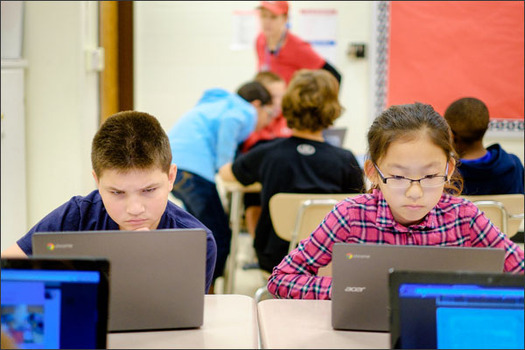 Fifty-five percent of students say it is either “extremely important” or “very important” to provide each student with a laptop. Forty-eight percent of students feel that way about tablets. African-American and Hispanic students are “much more likely” than whites to say it is critical for their schools to provide each student with a laptop or a tablet. Not surprisingly, most students feel that they know more about tablets and other computers than their teachers. Seventy-seven percent of high school students, just to cite one example, feel that way. The Pearson “Mobile Device Survey 2015” was administered online in February and March among 8-18 year-olds enrolled in grades 4-12. It was conducted among 2,274 total students.